Tangible Fun has produced a clever and progressive app that brings Spanish and English numbers 1-10 within the reach of a huge variety of users. As an app, it will appeal to the Primary-school-aged market wishing to learn numbers 1-10 in their own language, not only those with polyglot aspirations. However, the relaxed, interactive and welcoming aspects of this software mean that it will appeal to any reader with an interest in learning basic numbers. This bi-lingual app – either Spanish or English – is a great way to introduce any child to a second language and watch as they interact with basic numbers in a natural and intuitive way. The Spanish and English are presented in story form, which uses different tones and expressions so that learners can interact naturally with the language. The language is limited to the numbers 1-10 in its outcome, yet the story also serves to introduce other elements of vocabulary and structures in accessible and familiar way. 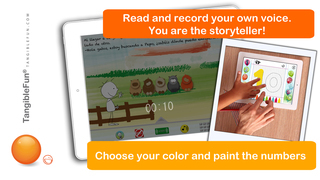 The opening sequence allows you to choose between Spanish or English storylines – with the entire running of the app being in the designated language. The story is complemented with pleasing background music which will only help to keep children engaged, focussed and wanting to work more and more on this app. The app is specifically aimed at younger learners, with the visual stimulus being provided by beautiful and interactive cartoon images, which help to reinforce the aim of the story – i.e. 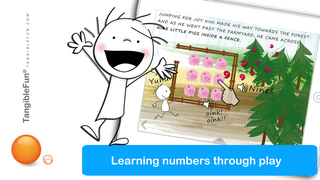 to learn numbers 1 - 10. Learners are introduced and reintroduced to the key vocabulary in a way that is accessible and enjoyable – there is a genuine pleasure in learning that is apparent. Furthermore, thanks to the app’s website there are free, printable resources (http://www.tangiblefun.com/la-mochila/) that will enhance the story even more and provide additional and fun challenges for the reader. Each element of vocabulary is introduced in its own contextualised way and slots nicely into the story as a whole, so users will not be subjected to monotonous and repetitive activities. The app places Spanish and English vocabulary within comfortable reach of those who use the app and the creativity and ‘playfulness’ of its design mean that to do so is far from being onerous. Additional features built into the story itself include the option to silence the background music and, more significantly, to record your own audio as the story plays out. This instantly transforms the story into a form of video book with the reader’s own voice or that of a parent, for example, recounting what is happening. A potential downside, however, is that the app offers no way for you to check and ensure that your pronunciation is correct, if Spanish or English is not the speaker’s forté. Yet, this added extra is just one more way in which the story can be brought to life –and from a pedagogical perspective serves to reinforce spoken competences. 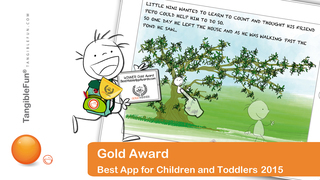 Overall, it is an extremely well-presented app with lots of engaging features that will not only educate but also keep any child engaged as he or she progresses through the story. 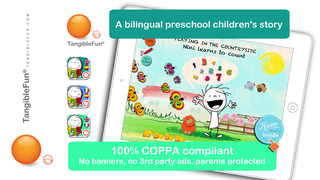 It uses simplicity and playful repetition to reinforce the Spanish language and the wholesome nature of the app and the printable worksheets found on the website will allow children to grow in confidence and self-esteem as they take their first multilingual steps. With this app, we aim to encourage children to enjoy learning using new technologies and also to help them develop their imagination with tangible resources, which can be downloaded directly from our web. The story consists of 35 illustrated scenarios and sounds which anímate the story interactively. In each page you will be able to record your own voice while narrating the text which goes along with each of the illustrations. 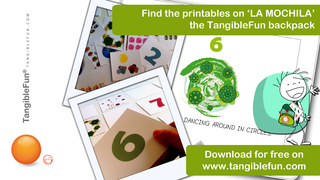 An excellent learning resource for inside and outside the classroom, which will allow children to become familiar with numbers in Spanish and English in a fun, interactive and tangible way. Nini learns to count is the first of a digital and tangible storytelling series, called PLAYING IN THE COUNTRYSIDE, where Nini, a cute little being who lives close to nature, learns to count thanks to his curiosity about the world around him. For Nini the world is a huge living garden where he is able to explore, learn and discover. His friend Pepo, the farmer, encourages him and always gives him the best advice. Little insects, pets, flowers and plants are some of his friends, as well as his source of knowledge. The series will contain plenty of adventures full of healthy values which motivate children to learn and build their self-esteem and creativity through colourful interactive settings, accompanied by music especially composed for each story. • Find 35 illustrated pages in English and Spanish. • No third-party advertising or in-app purchasing! • Parental control - COPPA compliant, made for ages 5 and under, but beware, it can also attract the imagination of big brothers & sisters! We are a creative team that makes digital and tangible educational tools for both inside and outside the classroom. Our aim is to make learning fun for children, taking advantage of the new information and communication technologies. TangibleFun is editor of interactive tales to encourage enjoyable learning. On our website you will also find tangible resources to practice being creative in many ways. Since 2013 in our blog we have talked about new technology for kids, cool toys, and educational activities to enjoy at home, at school or anywhere at all. If you have any trouble with the application or have any questions please feel free to contact us at support@tangiblefun.com. We will be more than happy to help you! If you liked our App, we will appreciate your feedback and rating. Find us at www.facebook.com/tangiblefun and follow us on www.twitter.com/tangiblefun to receive news about our last products.